In this tutorial we will guide you on how to install OpenCart 2 on your hosting account using FTP and following the OpenCart 2 installation wizard. To start with the OpenCart 2 installation process let's first obtain the installation package which can be downloaded via the Official OpenCart Download Page. Click on the Download link next to the latest available version of OpenCart 2 and save the file on your local computer. When the download process is complete extract the archive on your local computer and open the newly created directory. Inside the extracted folder you should see several files and a folder called "upload". This folder contains all files and folders that need to be uploaded on your hosting account in order to proceed with the installation process. Before proceeding to the next step you will need to rename the two configuration files of OpenCart. The first one is located under the upload directory and it is called config-dist.php, please rename this file to config.php. The second file is located under the /admin/ folder and it is also called config.-dist.php. You need to rename this file to config.php as well. Start your favorite FTP client and connect to your hosting account. First thing you should decide before uploading the OpenCart 2 installation files is under which folder of your account you would like to have OpenCart installed. For example, if you would like to have your store accessible directly via your domain name http://example.com you should use the public_html directory to upload your files. In case you would like to have your store setup into a subdirectory such as /store/ and have it accessible via http://example.com/store/, you should create a directory called 'store' under the public_html folder and upload your files there. When you are ready to proceed with the upload under the desired location, simply drag and drop all files and folders from the 'upload' directory of the OpenCart 2 archive to your hosting account folder. If all files and folders are present you are ready to access the OpenCart 2 Installation Wizard. The OpenCart 2 Installation wizard gives you the ability to finalize your OpenCart 2 installation in a 4-step process. Open your favorite browser and access your hosting account via your domain name. This should direct you to the OpenCart 2 installation page. The first step requires to accept the License Agreement. When you are ready to proceed click on the Continue button. The next step will perform a basic check of all files to make sure that all OpenCart 2 files and folders are present. If you have followed the steps in this tutorial closely everything should be OK with your files and folders. In case any of your files are not writable you might need to consult with the install.txt file included in the installation archive or contact your hosting provider to fix your files and folders permissions. During the next step of the installation process you will be asked for the Database and administrative login credentials. To proceed further with the installation process you should create a MySQL database with a user with sufficient permissions. 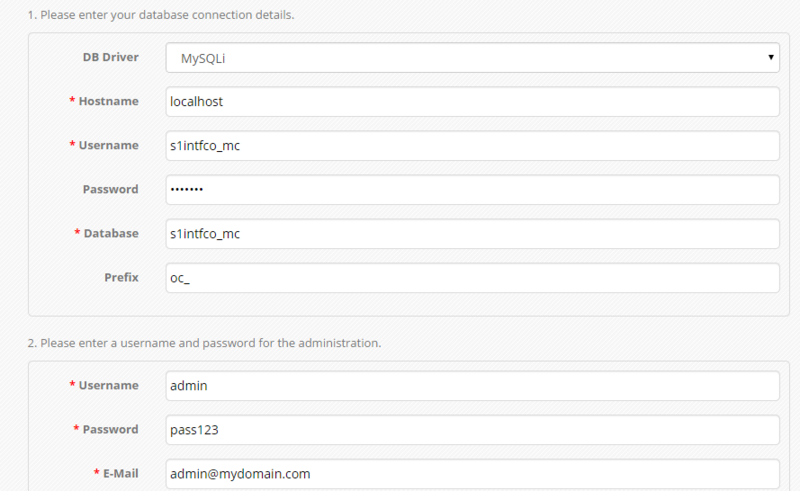 You can easily create a database and the required user for your installation following our tutorial on How to create a MySQL database via cPanel. When you are ready, please fill in your database name, username and password as well as the desired admin username and password. The latter will be used to access your OpenCart 2 admin dashboard. To finalize the installation process, please click on the Continue button. This should finalize the installation process and see the final screen of the OpenCart 2 Installation Wizard. For security reasons, please access your hosting account via FTP and remove the "install" directory.